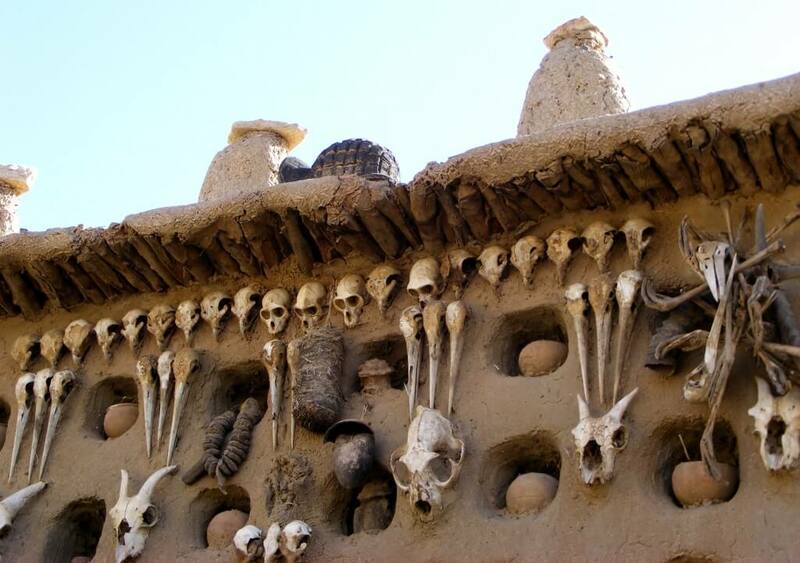 The Dogon is an ethnic group located in the East part of Mali, On the not far from the border with Burkina-Faso. They settled on the Bandiagara escarpment, far away from the Niger river, in the 14th century. The eldest person in the village is the HOGON, the spiritual chief which is in charge to keep traditional order. The HOGON is not allowed to be touched, not even by his wives. He wear special cloths, and a necklace made of stones. From the moment he become Hogon, he is not washing his body, since, by the believe, a snake is licking his body every night. Every Hogon has assistants, called BENEKESENA . They are priests and diviners that help him with his duties. In the photo you can see the entrance to his home. all the skulls are there as talismans.